I’m not sure about you, but I’m tired of cafés who aggressively try to be everything at once. You know what I’m talking about – those pretentious outlets who siphon money off you by slapping on an “artisanal” or “home-made” label on their pre-prepared offerings, when really no artisan or home would endorse a $22 mug of lavender tea. Thankfully, Olivia & Co. is as honest as they come. 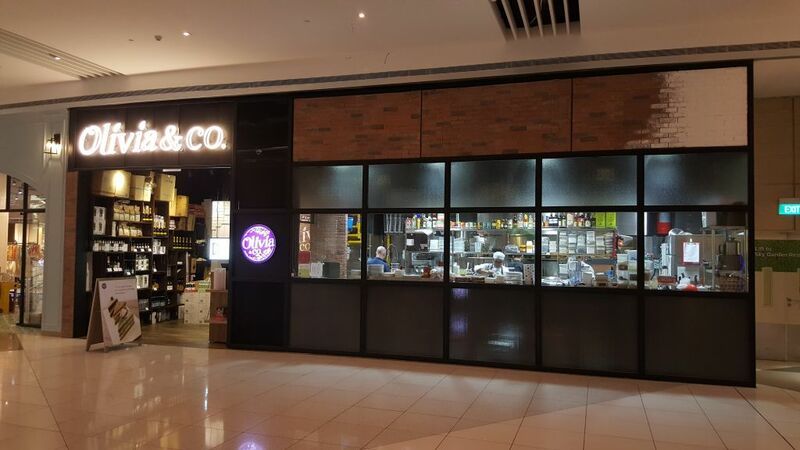 The blissfully unpretentious bistro sits on a virgin, island-style plot between Tower One and Tower Two of Suntec City, with a kitchen occupying a regular unit right beside the dining area. Since opening in March this year, Olivia & Co. has been delighting office workers and families alike with its diverse menu and reasonable prices. By introducing more wood and fabric in the dining area, Olivia & Co. hopes to welcome weary office workers by presenting a homely and comfortable vibe. 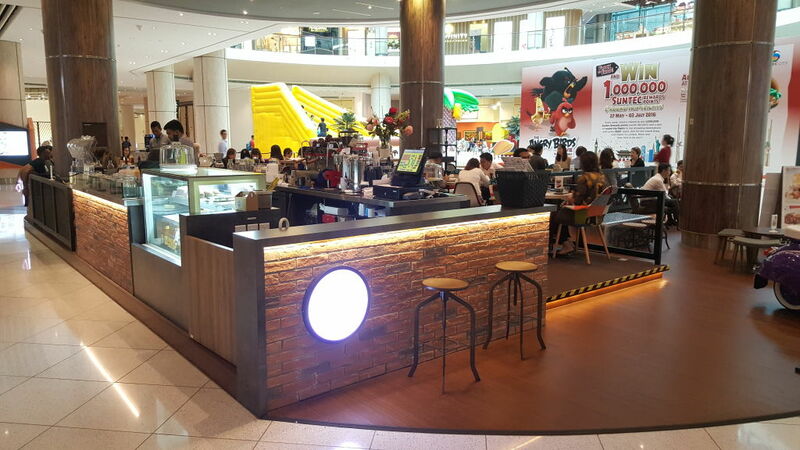 Popspoken also learned that an offer from Suntec to surround the island with glass panels was declined by the owners, who feel that “we already spend too much time within walls”. Adopting globe-trotting as a central theme, the menu mimics the palate of a seasoned traveller. Don’t be surprised when you see Tokyo Wings offered right above its spicier, Louisiana-style cousin, or notice an adapted bánh mì next to an all-American grilled cheese sandwich. 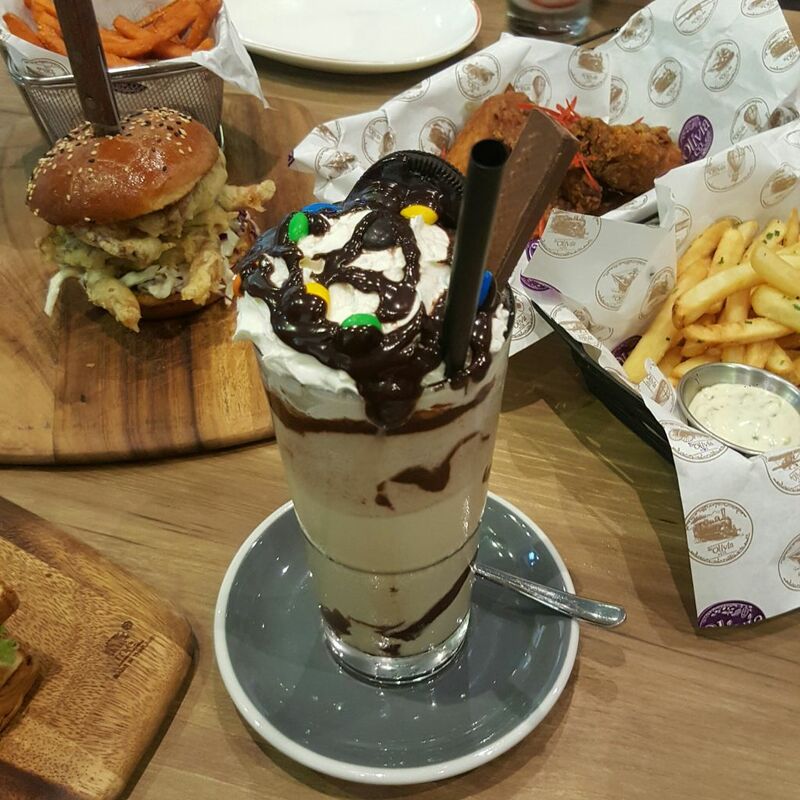 Popspoken was treated to a tasting menu of their crowd favourites, ranging from sensible milkshakes to decadent sandwich-ception creations. Here’s a quick look at some of their best picks. 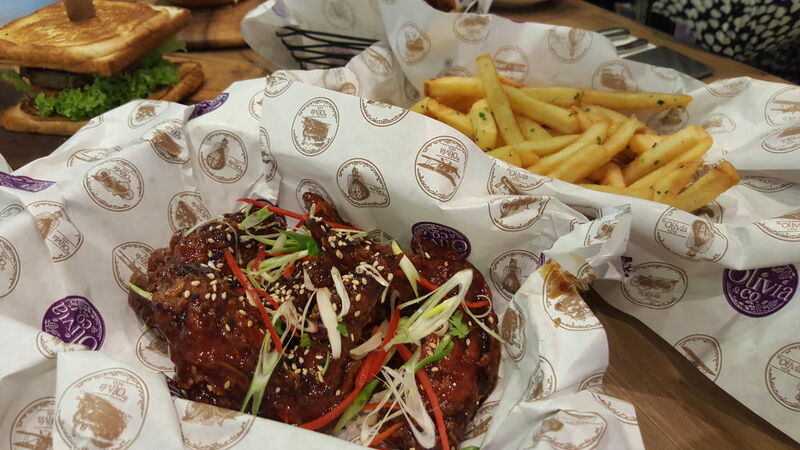 Starting off with an order of wings is always a wise decision. Starting off with TWO orders of wings should warrant you a Nobel prize. We sampled the Tokyo Wings and Louisiana Wings ($9 for 6/$16 for 12), two very different flavours for very different people. I preferred the former, with its crispy fried skin slathered in sweet teriyaki marinade. The hit-you-like-a-bus spicy Louisiana version awakens your palate immediately, and the combination of fish sauce, lime juice, and garlic is a force to be reckoned with. Are you game? 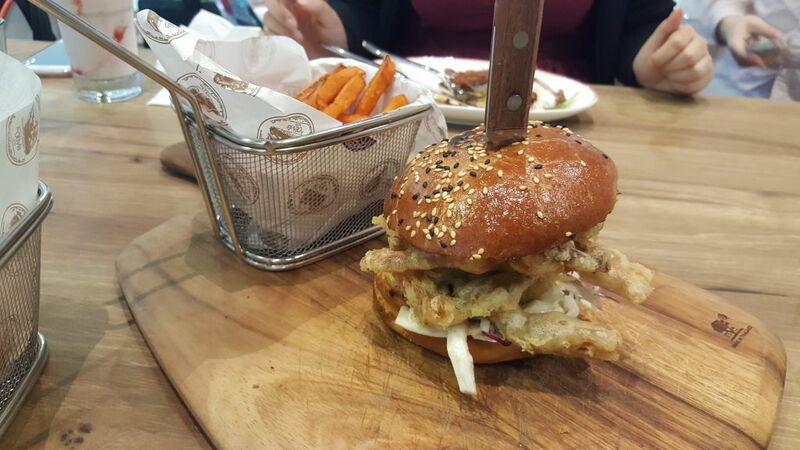 The Quayside Soft-Shell Crab Burger ($23) is another standout offering. Think tempura soft-shell crab between buttered brioche, with a truly scene-stealing sesame slaw that also includes coriander, spring onion, and jalapeño mayo (that’s a rock band name right there). The refreshing slaw worked beautifully as a contrast to the fried crab, even though the latter was not greasy at all. 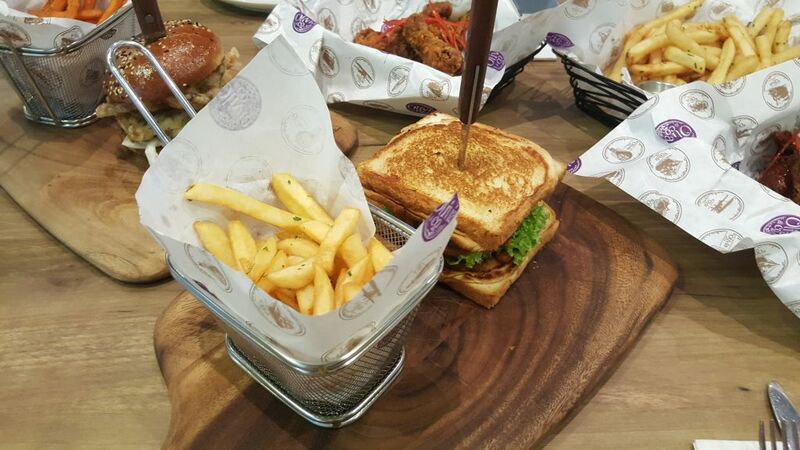 Did we mention it also comes with sweet potato fries? 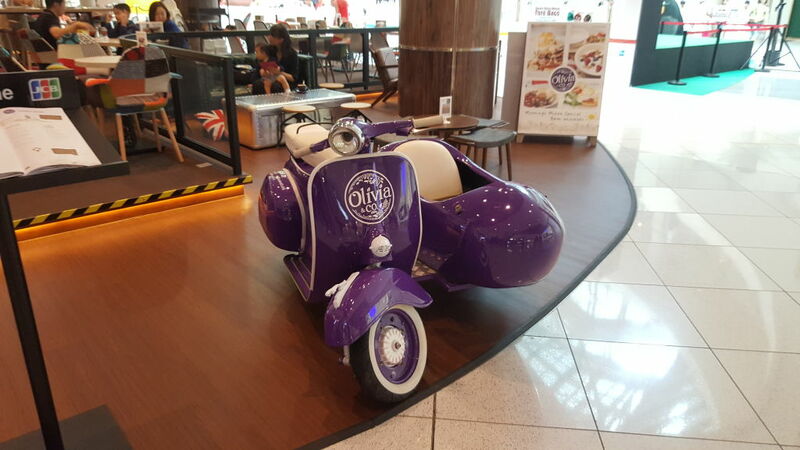 Olivia & Co. also boasts of its big plans for the future. Menu-wise, the three-month-old bistro is looking to introduce more sharing platters, a forward-thinking concept rooted in the observation that the popularity of Spanish tapas and other factors are pushing locals towards larger portions and a more group-oriented dining style. 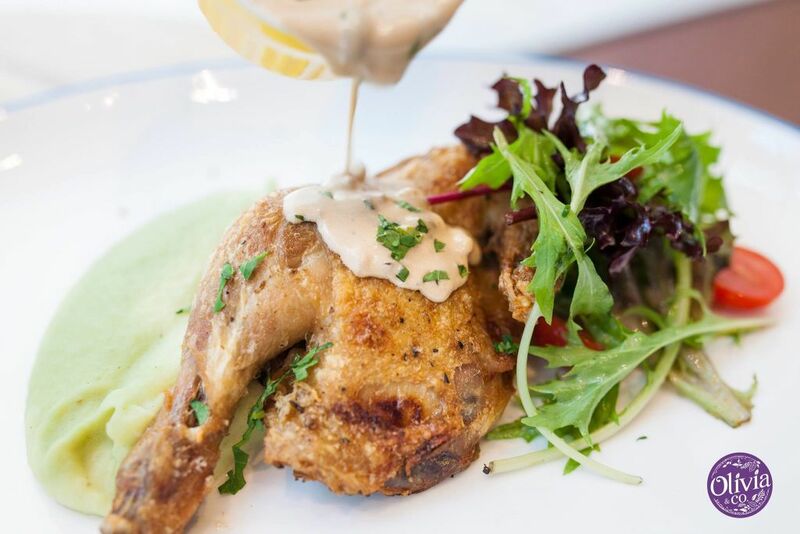 Their no-BS approach is seen most clearly in the delightful Spring Chicken ($14). Literally what the spartan name suggests, the half chicken is prepared in “half spatchcock” style, where the bird is butterflied for cooking. Served with a ridiculously addictive “pot-roasted gravy”, fresh sesame greens, and an unusual wasabi potato mash, this affordable option makes for a homely meal. We would recommend a serving of Truffle Fries ($12) to go along with this, because since when have we needed a reason to get truffle fries? If there’s one thing you have to try, it’s their selection of milkshakes. The Classic Shakes ($7) cover the basics of Vanilla, Chocolate, Banana, and Strawberry, but that’s not what we’re here for. Act close with the establishment by opting for one of Olivia’s Shakes ($9.50). 6 diverse flavours are available, ranging from the fruity, strawberry-mad Lushalicious to the decadently rich Nutmare. We also recommend the BBm, an outrageously OTT confection of fluffy candy floss, rainbow sprinkles, strawberry wafers, and rather ominous-sounding “sizzling surprise candy”. Looking for a more filling dessert? 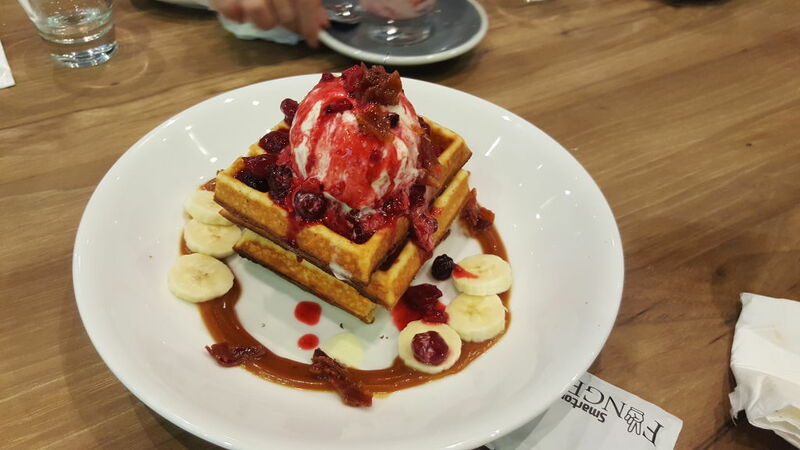 The Snorlax ($12) is a sweet and savoury waffle that’s a reference to you in the stages of food coma after. Berry compote, savoury bacon pieces, sliced bananas, and a topping of peanut butter and honey come together to form this twist on a breakfast favourite. Besides the dine-in experience, Olivia & Co. are also working to brand themselves as a consumer-oriented supplier of coffee blends and, get this, soda pop! 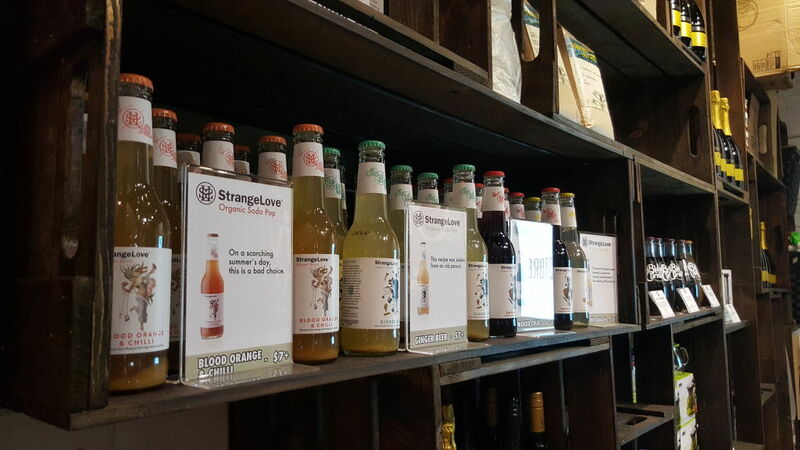 We sampled 4 bold flavours from Australian “organic soda pop” label StrangeLove, with Olivia & Co. being the only place in Asia where you can get your hands on one of these! 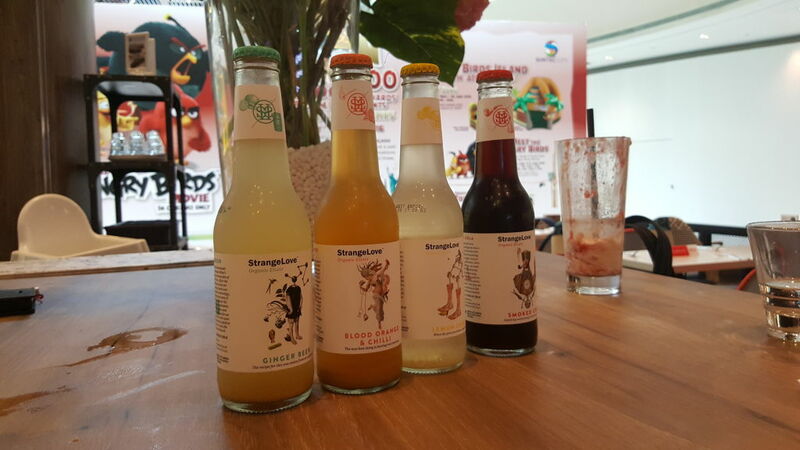 For the timid conservative diner, the Ginger Beer and Lemon Squash (all flavours at $7) are safe bets, competently offering what their names suggest. Honestly though, the Smoked Cola and Blood Orange & Chilli are where it’s at. Smoked madagascan vanilla pods, nutmeg, and cinnamon are infused into regular cola – making all that sugar worth it. 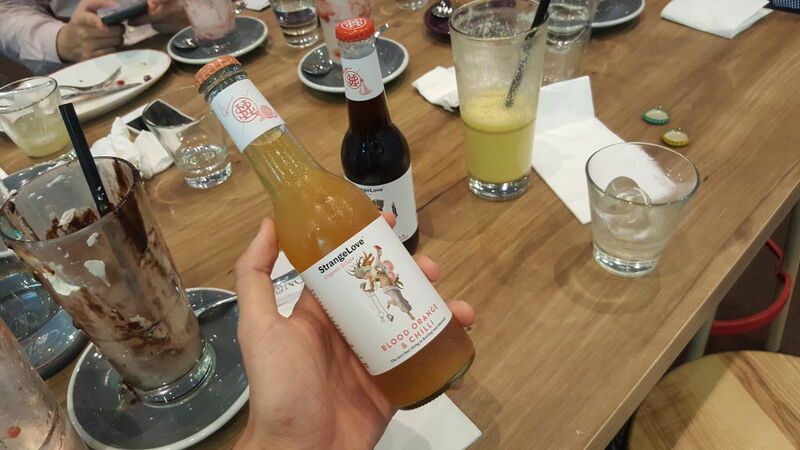 The Blood Orange & Chilli beverage is perhaps the most exciting – a combination of Italian blood orange and red chilli creates “a drink that lets you feel again”. Clearly not the drink of choice on a hot summer’s day (it even says so on the label). But we’ve said a lot. Now it’s your turn to try Olivia & Co. for yourself. Drop your friends and family a message – you’re about to bring them to your new favourite brunch hideout.